The No. 7 Arizona Wildcats can clinch at least a tie for the Pac-12 title, but it will take a victory at a place that has been problematic for coach Sean Miller. Arizona (26-4, 15-2 Pac-12) travels to Tempe for Saturday’s game against Arizona State in the regular-season finale for both teams. Miller is just 4-3 on the home court of his state rival, having lost three of the past five meetings. On the plus side for the Wildcats, Miller is 3-0 overall against second-year Sun Devils coach Bobby Hurley, including a 91-75 victory in Tucson earlier this season. “Bobby Hurley has done an outstanding job coaching his team this year,” Miller said. “Not many coaches have gotten more out of his team than he’s gotten out of his team. They’re downsized, they play small ball, but he’s made it work. They score, they play at a fast pace, they use the 3-point shot as a real weapon, and they have learned how to survive on defense playing that small. Arizona State (14-16, 7-10) is coming off an upset victory against visiting USC. The Sun Devils were down 10 with 2:32 to go but came back to win 83-82. Arizona is coming off a 77-72 home loss to then-No. 5 UCLA, dropping the Wildcats into a first-place tie with Oregon. The Ducks, who finish up Saturday at Oregon State, would earn the No. 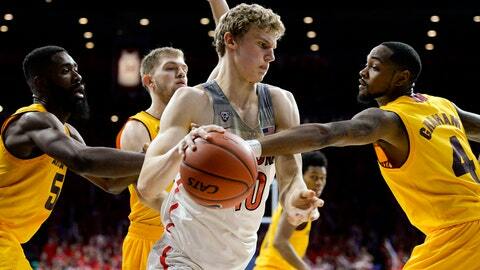 1 seed for the Pac-12 tournament in case of a tie because of a head-to-head victory over Arizona. Arizona guard Allonzo Trier, who did not play in the first game against Arizona State because he was in the midst of a 19-game NCAA suspension for a positive PED test, scored a career-high 28 against UCLA on Saturday. He moved into the team scoring lead (16.2 points per game) over freshman 7-footer Lauri Markkanen, who is looking to regain his 3-point touch. He is shooting 44.4 percent from behind the arc (59 of 133), but he made only 5 of 26 in February. Miller said fatigue might be playing a part. Arizona has a distinct size advantage in this matchup, outrebounding the Sun Devils 38-22 in the first meeting. In their four-guard lineup, only 6-foot-8 Obinna Oleka is taller than 6-5. Arizona State loves to run and shoot the 3. The Sun Devils’ 79.3 points per game is the school’s best mark since the 1997-98 season. Their 300 made 3-pointers is the fourth-best mark in conference history. Guard Torian Graham averages 18.3 points, followed by guard Tra Holder (16.8) and guard Shannon Evans (15.4). The “fourth” guard in the lineup, Kodi Justice, scored a career-high 22 vs. USC and is 11 of 18 from 3-point range in the past two games.